China plays host to the world’s top kiteboard racers for the first time as riders fine-tune equipment and familiarize themselves with the conditions. 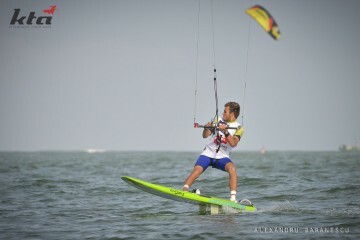 Riders chose 8m to 10m kites to match the winds which ranged from 18 to 20kts as they ripped over the clear waters of Boao’s King Bay in preparation for the International Kiteboarding Association’s (IKA) course racing world championship being staged in China for the first time. Reigning world champions Johnny Heineken (USA) and sister Erika went through their paces on the two tracks laid side-by-side during a series of practice races. A fleet of 160 riders, from more than 40 countries around the world, enjoyed the moderately smooth waters inside the reef. 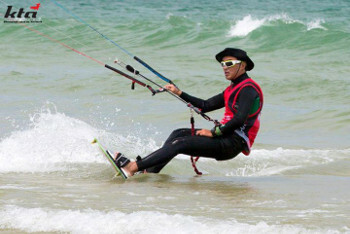 The IKA Kiteboard Race World Championship, which is managed and locally organized by King Bay resort and Kite Tour Asia (KTA), will see five days of exhilarating action in the forecast moderately strong winds to crown the new men’s and women’s champions. Markus Schwendtner, IKA CEO, and Neil Godbold, KTA founding director, told the crowd of spectators and riders assembled on the beach of their delight at being in China for the for the first time and gratitude to King Bay for hosting the event and acting as main sponsor. Under clear skies the competitors – 120 men and 40 women – proudly gathered in groups behind banners of their national flags in front of the stage set up on the beach. The backdrop was completed as other riders gave stunning demonstrations of racing and freestyle disciplines. Godbold expressed his thanks to all those who had worked so hard for 18 months to make the event possible and the riders who had journeyed from all parts of the globe to compete for the world titles.